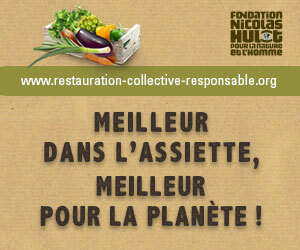 Eating City participates to the new portal of responsible public food service launched by the Foundation Nicolas Hulot. As public food service has been until now the poor relation of catering, far behind gourmet restaurants, today, the race for sustainability could be a chance to restore the status of such service and to highlight the cooking qualifications of these professional chefs required to prepare good and nutrient meals, lowering environmental impacts and with a limited budget. Such shift of Public Food Policy towards sustainable food systems is emblematic of the cultural change good public meals may induce in the population. If the introduction of organic food often is the way to initiate a change, more generally, the modification of meal ingredients and the reduction of food wastage are two major areas of focus that drive to a deep and challenging reorganization of meal preparation, only feasible with skilled staff. Therefore training and education, to raise awareness and increase skills are a main leverage of action. Because of the foregoing, Eating City is glad to be part of this collaborative tool kit, by sharing all suitable ressources: report best practices, videos, etc. that can contribute, together with all other partners of this portal, to support projects owners, from farm to fork, producers, buyers, cooks, but also assocuiations and local authorities, who all have a part to play in sustainable public food services. Our Vision - Legal Notice - Eating City's collaboration with the portal "Restauration collective responsable"